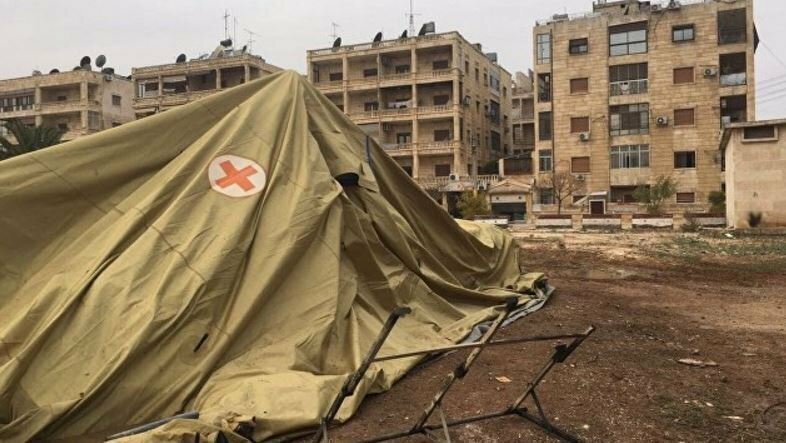 The killing and wounding of Russian medical personnel in a rocket attack on a military field hospital in Aleppo raises again the question of who is actively lending support to the terrorists in Syria, people depicted in the West as ‘moderates’ in a monstrous inversion of the truth. Such has been the Goebbelsian nature of Western media coverage of the conflict in Aleppo, Nusra Front (now Jabhat Fateh al-Sham) have morphed from a terrorist organization, which in its methodology and objectives is near indistinguishable from Daesh (otherwise known as Islamic State), into a latter day version of the French resistance or Partisans of Second World War repute. In the process the only real moderates engaged in the conflict in Syria — the Syrian Arab Army, Russia, Iran, and other allies — have been demonized, accused of targeting and terrorizing civilians, including children, when they have in fact been liberating them. History will not be kind to those who have propagated the lie that something approximating to a democratic revolution has been underway in Syria. On the contrary, the country and its people have suffered the depredations of an Islamic Khmer Rouge, intent on ‘purifying’ a multicultural and multi-religious society of minority communities that are able to trace their existence in this part of the world back over a millennia and more. The vast majority of Syrians, without whose support the government would have collapsed long before now, utterly reject the ideology of these extremists — thousands of them non-Syrians who’ve descended on the country from across the Muslim world and beyond like a plague of locusts, taking advantage of the destabilization of the region wrought by Washington and its allies in recent years. The sinister aspect to the conflict in Syria, which the attack on the Russian military field hospital raises, is the extent to which these so-called rebels have enjoyed the support of Western and regional powers. How else are we to explain the way they have been able to survive for so long? Who has been supplying them with the weaponry, money, material, intelligence, and logistics support that has allowed them to do so? Comment: America is the number one “State Sponsor of Terrorism”. The Islamic State is not only protected by the US and its allies, it is trained and financed by US-NATO, with the support of Israel and Washington’s Persian Gulf allies. Who are the War criminals in the air strikes against Syria? Russia in particular has been vilified in the West over its role in the conflict. Indeed a neo-McCarthyite anti-Russian propaganda offensive has been waged across Europe in response to Russia’s military mission in the country, one whose intensification in recent weeks has paralleled the operation to liberate Aleppo. We have seen Russian media outlets, such as RT and Sputnik International, being targeted and accused of peddling pro-Russian propaganda rather than news. We have also seen US State Department spokesman, John Kirby, refuse to take a legitimate question from an RT correspondent recently. There is an insidious element to this unprecedented level of Russia-bashing in the West, wherein it is not Russia’s government that is being demonized but Russia itself — with the clear inference that the Russian character is inherently dishonest, underhand, wicked, etc. It is no longer credible, much less ethical, to describe people engaged in acts of mass murder and slaughter in Paris, London, Brussels, or in the US, as terrorists, while at the same time describing those responsible for the same murder and slaughter in Syria as ‘rebels’. In fact it is obscene beyond measure. Like Afghanistan, like Iraq, and like Libya, in Syria a grotesque experiment in human despair has been taking place, wherein murder and extremism has been presented as resistance and revolution, with those struggling to protect civilians from terrorism depicted as the terrorists. George Orwell himself could not have done better than produce what passes for western media coverage in this regard. You can either stand with those who are fighting terrorism or you can stand with the terrorists. What you cannot do is both — i.e. rhetorically maintain a position of being against terrorism while acting against those who are risking their lives fighting terrorism on the ground. It is why the enemy of people in Britain, France, the US, all across the West, is not Russia, as their governments would have them believe, but rather the hypocrisy of said governments and their media acolytes. Syria, thanks to the tenacity of its government and armed forces, supported by Russia, will not go the same way as the countries already mentioned — Afghanistan, Iraq, and Libya — and see its society disfigured, its development destroyed, and its culture despoiled in service to a hegemonic agenda that has been responsible for human suffering on a grand scale. While it may take years to be rebuilt, given the scale and brutal nature of the conflict that has engulfed it, rebuilt it will be. What will never be rebuilt are the reputations and integrity of those who have written a new page in the annals of mendacity and duplicity, both of which have underpinned the West’s words and actions when it comes to Aleppo and the wider conflict in Syria. To paraphrase none other than Winston Churchill, in the West the truth is being protected by a bodyguard of lies. Comment: Coverage of the Syrian war will be remembered as one of the most shameful episodes in the history of the American press.